The prosecution comes amid heightened trade tensions between China and the U.S. and as the Trump administration raises alarms that Beijing remains intent on stealing technology and inventions to gain an economic upper hand. The two nations have each imposed billions of dollars in tariffs on each other in a reflection of a confrontational relationship with national security as well as economic ramifications. The case, which involves trade secrets worth up to $8.75 billion and allegedly stolen from Idaho-based Micron Technology Inc., is the latest in a series of prosecutions targeting Chinese corporate espionage. On Tuesday, for instance, federal prosecutors in California charged Chinese intelligence officers and hackers working for them with trying to steal information on commercial jet engines. Other cases have involved stolen wind turbine technology and software source code. “China — like any advanced nation — must decide whether it wants to be a trusted partner on the world stage, or whether it wants to be known around the world as a dishonest regime running a corrupt economy founded on fraud, theft and strong-arm tactics,” Attorney General Jeff Sessions said at a news conference announcing the criminal case and a new China Initiative. The charges name two companies, one in China and one in Taiwan, and three Taiwanese defendants. A Justice Department spokesman said the defendants were served summonses in Taiwan and that none is in U.S. custody. The Chinese Embassy did not immediately respond to a request seeking comment Thursday. One of the charged individuals had been general manager and chairman of a company that Micron acquired in 2013 and then went to work two years later for the Taiwan semiconductor company, United Microelectronics Corporation, or UMC, where prosecutors say he orchestrated the theft. That man, identified by prosecutors as Chen Zhengkun, recruited both of his co-defendants to join him at UMC. One, according to prosecutors, downloaded more than 900 confidential and proprietary Micron files before he left and stored them in personal cloud storage and on external hard drives so that he could access them at his new job with UMC. The company partnered with a Chinese-controlled business, Fujian Jinhua Integrated Circuit Co., to mass-produce technology memory storage products used in computer electronics. The indictment was announced one day after the Trump administration imposed restrictions on technology exports to the Chinese company that was charged, citing national security concerns. Beijing has spent heavily to build up Jinhua and other chipmakers as part of efforts to transform China into a global leader in robotics, artificial intelligence and other technology industries. The United States also Thursday sued to block the transfer of trade secrets and to prevent the companies from exporting to the U.S. any products that they manufacturing by exploiting stolen information. 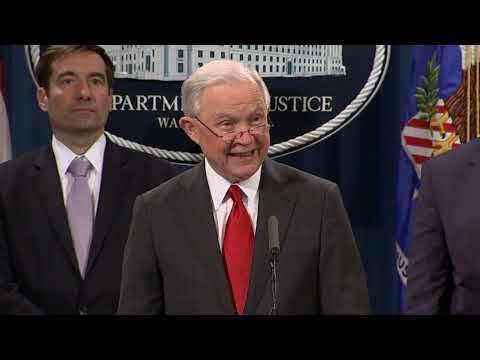 In addition, the Justice Department announced an initiative to target Chinese economic espionage by identifying priority cases and ensuring there are enough resources available. The administration has characterized China, along with Russia, as a strategic competitor of the United States. The U.S. has taken an increasingly confrontational stance toward what it characterizes as China’s “predatory” economic policies. Secretary of State Mike Pompeo set the tone in a June speech where he accused China of an “unprecedented level of larceny” of intellectual property. Tensions over trade in particular have exacerbated relations between the two world powers. President Donald Trump has imposed tariffs on $250 billion in Chinese products in an effort to narrow the U.S. trade deficit with China. China has retaliated with tariff increases on $110 billion of American products. The tensions have extended into security issues. China has criticized U.S. arms sales to Taiwan, which Beijing considers a renegade province, and the U.S. has renewed its criticism of China’s island-building in the disputed South China Sea. In recent weeks, Trump has accused China of meddling in U.S. elections but hasn’t presented substantive evidence of such interference. In a tweet Thursday, Trump said he had spoken with Chinese President Xi Jinping and that they had talked about many topics, but mostly trade. He said U.S.-China discussions on trade are “moving along nicely” with a meeting being scheduled at the G-20 summit in Argentina, which begins late this month. Associated Press writers Matthew Pennington and Deb Riechmann contributed to this story.